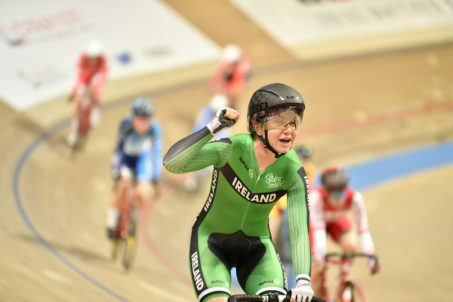 Ireland’s Lydia Boylan has won the 2019 UCI Track Cycling World Championships Silver Medal in the Women’s Points Race at the Pruszkow Arena in Poland – just 48hrs after team mate Mark Downey won Bronze in the Men’s Points Race. Boylan, who lives in Dublin, helped Ireland to a stellar ninth place in Saturday’s Women’s Madison with Shannon McCurley and lined up for Sunday’s Points Race gunning for better. She won the third sprint of the 25km race, then with less than 10 laps to race, attacked. Working hard with one other rival, she joined the back of the bunch and gained that crucial lap, putting her in Gold Medal position with five laps to race. Digging deep for the final sprint to the line, she held on for that incredible Silver Medal – Ireland’s second medal of the 2019 UCI Track Cycling World Championships, and Boylan’s first at a World Championships. Lydia Boylan said: “It still hasn’t sunk in that I’ve finally done something on the world stage. It’s a big boost of confidence for me, for sure. Downey’s medal on Friday was Ireland’s first UCI Track Cycling World Championships medal since Martyn Irvine won Silver in the 2014 Scratch Race, having won Silver in the 2013 Individual Pursuit and Gold in the 2013 Scratch Race.